Sidefold murphy beds are perfect for very small spaces. This SICO Eurobed sidefold murphy bed horizontal folding system was installed in a very small room. Couldn’t be said it was a bedroom, more like a large closet where they integrated a horizontal murphy bed. This is cherry wood with a cherry penetrating stain. Two coats of clear lacquer were applied after the stain had cured. The lowered table on the sidefold murphy bed measures 45” wide by 24” deep. The entire system is 94” wide, 78” height, 20” deep. When the sidefold murphy bed is lowered, it extends into the room just 69” from the wall for an impeccable way to integrate a horizontal murphy bed into a small room. 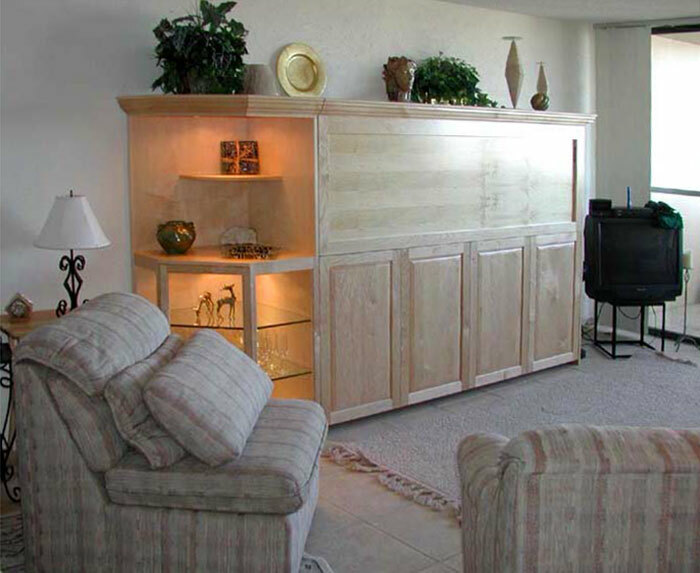 This sidefold murphy bed system lives in Sedona, Arizona. Our popular Zen design with two pier cabinets. One of the pier cabinets has our Hidden Nightstand – really HIDDEN. It is only available when the sidefold murphy bed is lowered, but it is behind the door to storage. 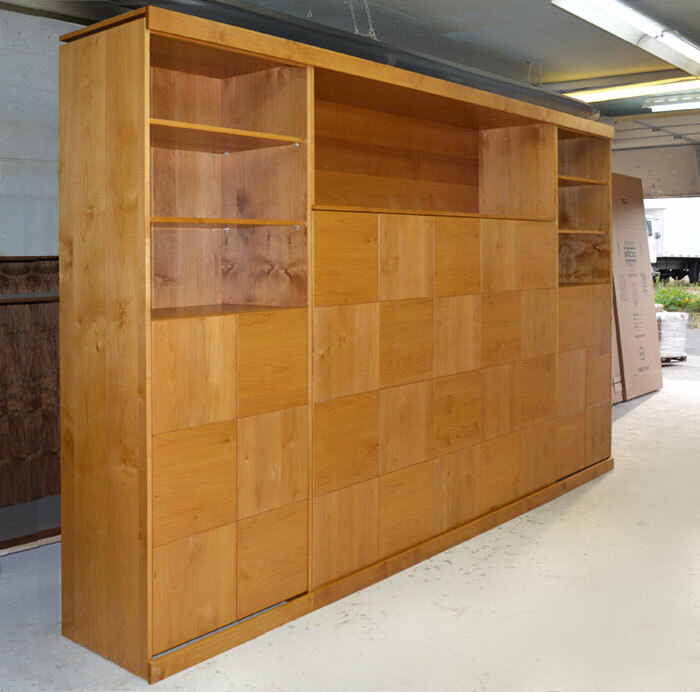 It works great for an ideal way to integrate a horizontal murphy bed into a design studio or meditative area. The Queen bed stores away into 21” depth. On this model we have a Latex and Memory Foam 14” thick mattress. The built in foundation from the SICO Eurobed frame is steam bowed wood slats. This adds to the comfort of the mattress you purchase. Any mattress, any size, any weight. 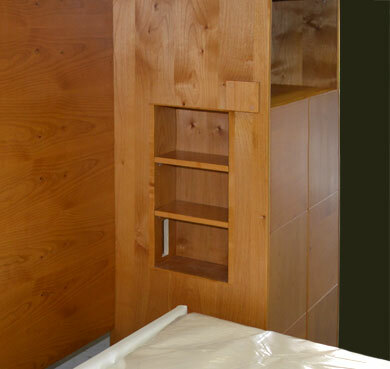 Integrate a horizontal murphy bed into a variety of spaces to accommodate a number of uses. The owners requested we install this sidefold murphy bed system. Because we consider Arizona a neighbor, we ran down and installed it in 3 days total. This client worked for the newspaper in downtown and loved to entertain. This is his ‘downtown studio apartment’ when he got snowed in! That is his excuse he couldn’t make it home and he is sticking to it! 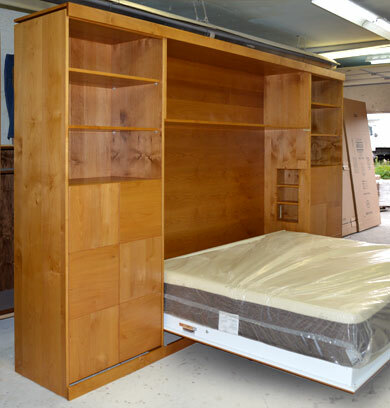 Integrate a horizontal murphy bed into a regular space, including a living room where you can welcome your guests. 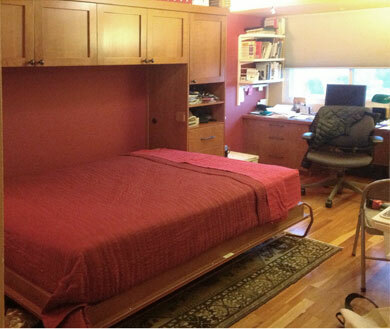 integrate a horizontal murphy bed with display fixtures. 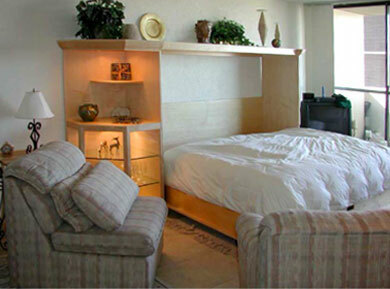 Integrate a horizontal murphy bed with white maple with a soft-tinted glaze. Upper section was left a Flat Panel theme to post articles and reference material. Really nice 13” thick mattress. The selection of color is 100% the choice of the client and their designer! This was a hot color back in the 80’s. By turning the SICO Queen Room Maker mechanism on its side, the lowered the bed extended into the room 20” less than Vertical Fold model. Same comfortable mattress and easy lift operation. 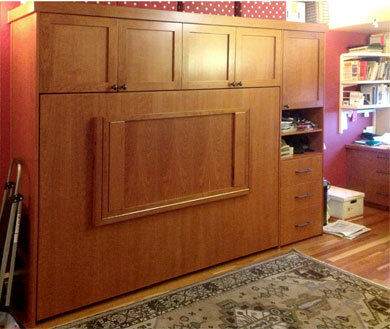 The bed cavity of this Sidefold murphy bed did increase in width 20”, but that extra width was available in this room.